Creating beautiful tables is really one of my favorite things to do and one of the things I miss most about my wedding planning days. I generally try to set a pretty table for holidays and special occasions, but admit that I have been terribly lazy about it as of late. 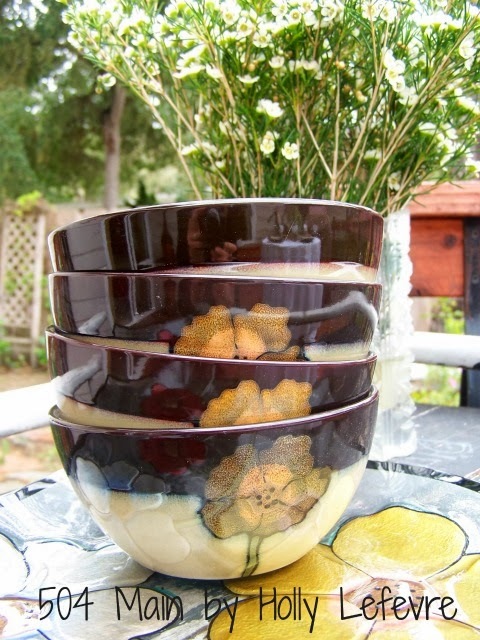 Recently I received some beautiful dishes and a gorgeous glass platter from Pfaltzgraff's Painted Poppies collection. I was so inspired to invite a few girlfriends over and have a lunch and coffee on my newly refinished deck! I LOVE mixing textures and styles to create truly unique tables and that is just what I did here. Because my life is a little more hectic than usual, I shopped my house for the decor and just whipped up a little project or two to make this table come to life. The Painted Poppies are a rich and vibrant. The poppies literally "pop" against the earthy beige background. I toned down my tablescape to let the dishes be the star of the show. First I laid my favorite white tablecloth on the patio table. I pretty much use white tablecloths as my base for every table and then layer it on...but this time, I left the white alone. I added a simple centerpiece comprised of a glass cake stand (a must have), my Painted and Stamped Pots, some succulents, ornamental kale, and moss. To finish it off I tucked in some sprigs of chamomile. It still needed a little "something" so I added an Everything Wreath with a burlap cover around the base of the cake stand for some texture and interest. 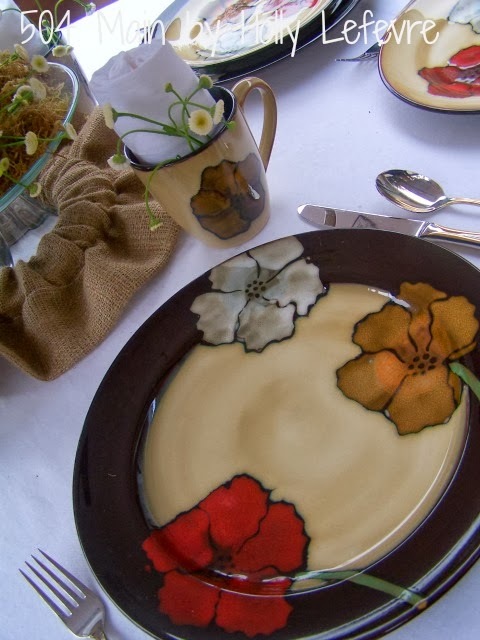 So a pretty simple look to accompany the Painted Poppies...and look how these Pfaltzgraff dishes shine! The dinner plates are so pretty. It is always cool here, so I used the coffee cups as part of the place setting. 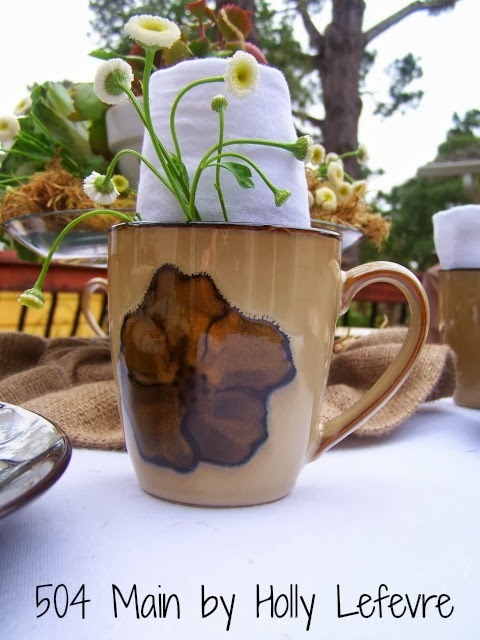 For a little something different and to make sure everyone saw how pretty the plates are, I rolled white napkins and placed them in the coffee cup...and added the sprig of chamomile again. I think this is fun and so pretty! 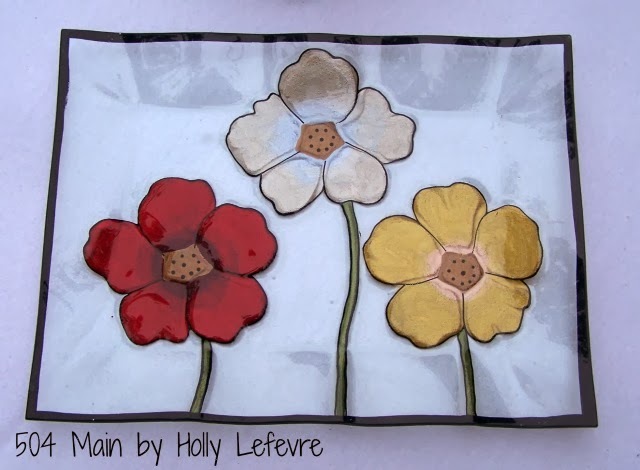 Painted Poppies Rectangular Glass Platter. with the soup bowls (which I will be using to serve dessert). 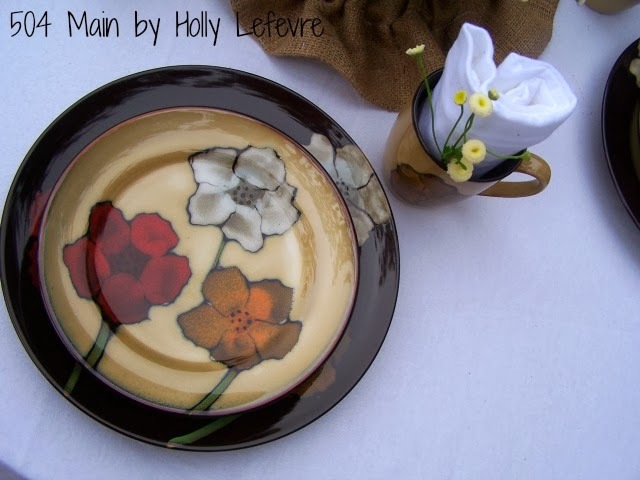 I am so loving these beautiful Painted Poppies dishes and the platter is a work of art! These pieces are available at Kohl's...but right now you have an opportunity to win either a a 4 piece place setting of Painted Poppies or the Painted Poppies Glass Platter. 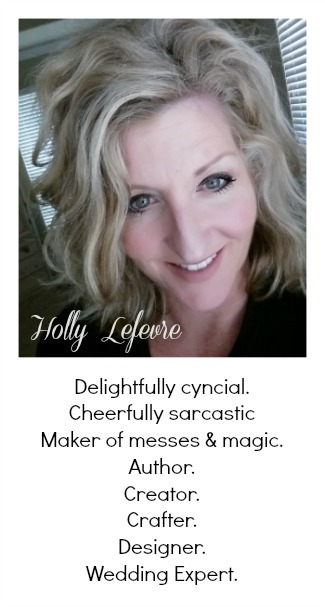 This post is written and created at 504 Main by Holly Lefevre disclosure: product and/or compensation was provided for this post. Winners prizes will be shipped by post sponsor. Those plates are amazing and the platter is gorgeous! I love poppies and had no idea of this pattern. Thanks for sharing. The poppy platter is gorgeous but what I love even more is how simple - a non-crafty person like me can replicate this theme easily. 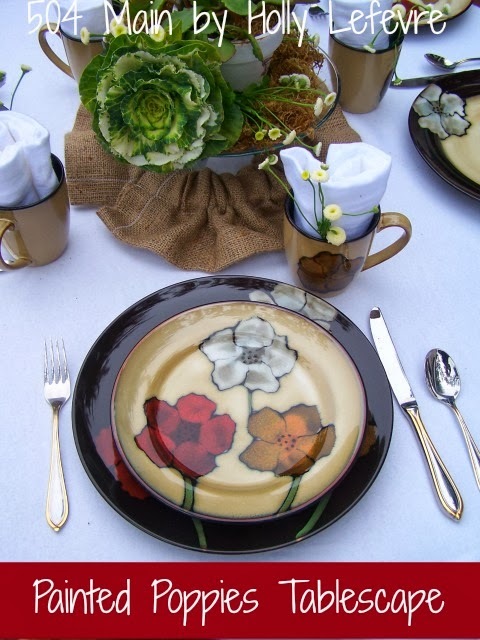 I like the rich, shimmering colors of the painted poppies dinnerware. 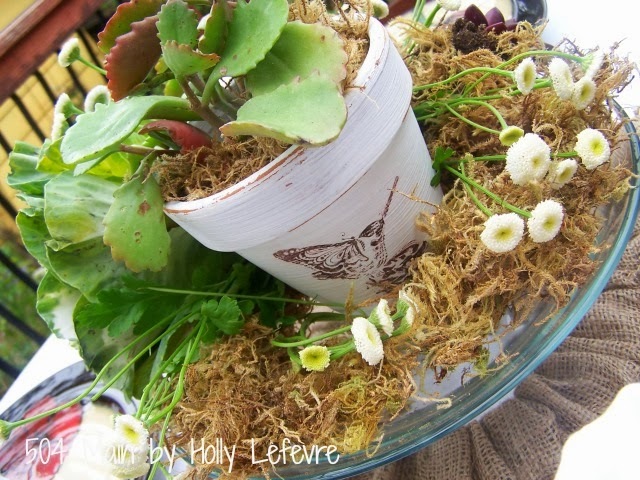 Also, I like the earthy feel of the tablescape,by using succulents as a focal point. I think my mother-in-law would love these dishes! 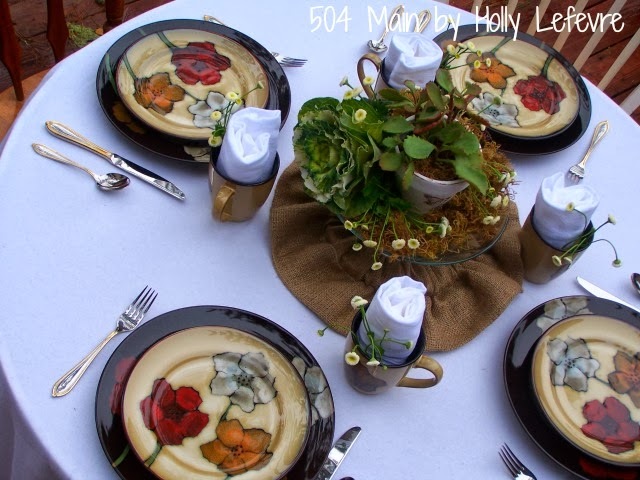 I always love your tablescapes, Holly! The poppy collection is stunning, and I think a simple tablescape was definitely the way to go so they could shine. So pretty! Those plates are gorgeous and so is the table! Gorgeous!! I've been looking for new dishes.Love poppies, unfortunately they don't do well in SC It gets too hot. They are freaking beautiful! I want them!!! The dishes are very pretty, and they give such a nice, warm feeling to the table. I think they look really pretty. I'm so sick of this cold weather and it totally gives off a warm spring feeling to me. I would love to have these on my table to share with my family. I think the dishes are very pretty. Almost a work of art. I would love to have them. Love the poppies and they look adorable...spring is on the way and these really make the table spring ready. love them. I love it! Casual yet elegant and sophisticated. What a beautifully breathtaking tablescape, Holly! 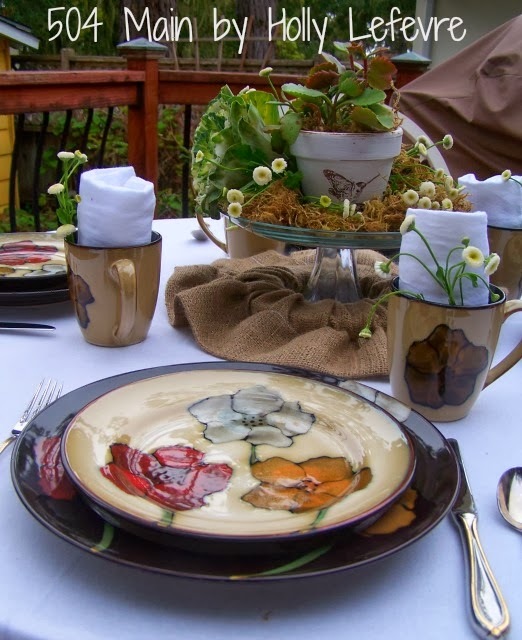 I love the painted poppies - I think they are great for a year round place setting that is pretty yet functional! I love the way you decorated the tabelscape! I love the poppies.. one of my favorite flowers in my garden :) and the platter is SUPER cute! I love the colors of the painted poppies and overall look of the table layout. I really liked your stamped planters and plan to make some with my daughter for my Mom to brighten up her yard! I love the design on this set! So many ways you could personalize your table set up too! I would love these for Thanksgiving since we always host, perfect fall colors. I love the table. Poppies remind me of summers in Europe. Oh those are just beautiful colors! I love the design and they look so beautiful! I love the natural look of the table settings. And of course, I adore poppies in any form! I do love it! It's so colorful and beautiful! Love it - unique style!!!! I love it! We can use some more color! I think it's very cute. Something that can be dress, or every day! I'd really love the platter! These table arrangement is lovely. I love poppies and had no idea that this pattern existed. 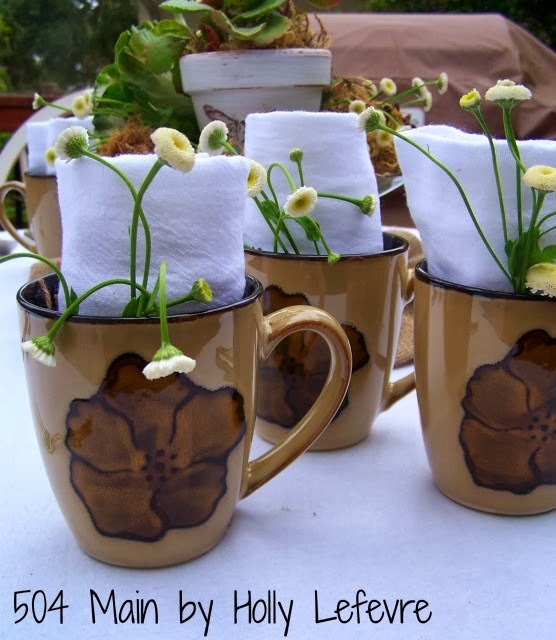 I love your arrangement, especially the chamomile sprigs and napkins in the coffee cups. So pretty! I hadn't seen these dishes in the store before, but I really like them. I DO love painted poppies, or poppies in any medium, for that matter. They are probably my favorite flower. I love what you've done with your table too. Love everything about these pictures!! The table, the poppy design is beautiful!! I love how beautiful the plates look. Very Unique. I like the napkins in the mugs. That's a fun place to put them. I have been looking at this pattern because I love poppies but it was a little out of my price range. And now you're offering it as a giveaway. Your outside table all set up makes me a little jealous because I wouldn't be able to find my outside table under all of the snow. Hopefully spring is soon. I like this pattern. I recently redid my kitchen in these colors. The pattern is SO pretty!!! The table decorations are wonderful too!! Love it! kristiedonelson(at)gmail(dot)com Thank you! I absolutely love it! i fell in love with poppies when i was in italy. they were everywhere and just so simply beautiful! I really love the poppies tableware & the table! Gorgeous! I love the way you set the table up! Poppies are my favorite flower and the patter is amazing! I am loving that table! The painted poppies are so pretty and well done with bright colors and a great design. Poppy is the nickname of my little grand daughter too. I like the glazed pottery look of these dishes. Such a pretty tablescape!! Love it!! Thanks so much for stopping by!! I love anything with poppies and this tablescape is no exception! Your table is beautiful! Your talents are amazing and I love the poppy tableware.